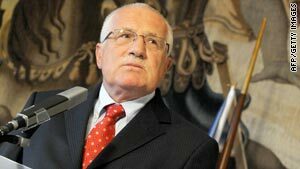 The signature of Czech President Vaclav Klaus means the Lisbon Treaty could come into force within weeks. (CNN) -- Czech President Vaclav Klaus signed the European Union's Lisbon Treaty Tuesday, he announced on his Web site, paving the way for major changes to the way the 27-nation bloc is run. The Czech Constitutional court ruled hours earlier that the treaty did not conflict with the country's constitution, a government spokesman said. "I respect the decision of the Constitutional Court," Klaus said in a written statement, though he added he "disagreed" with it and said the court's analysis was "not neutral." However, he concluded, "I signed the Lisbon Treaty at 3 p.m. (1400 GMT)." The Czech Republic was the last EU nation left to approve the treaty, which could effectively give the EU a president and a foreign minister. Klaus's signature means the treaty -- which would replace the EU constitution and aims to streamline the workings of the European Union -- could come into force as early as December 1. The Czech Parliament's two chambers voted in favor of the treaty earlier this year. But in late September, 17 Czech senators asked the country's Constitutional Court to examine whether some further parts of the treaty were compatible with the country's constitution. The court ruled Tuesday that they pose no conflict. Klaus agreed Friday to ratify the document if the court approved, after winning an exemption ensuring it would not allow ethnic Germans forced out of the country after World War II to reclaim their former lands. "I consider this to be the best possible result and intend to raise no other objections to the ratification of the Lisbon Treaty," Klaus said Thursday after gaining the exemption. Voters in two countries had rejected the EU constitution in 2005. The Lisbon Treaty, in addition to streamlining EU decision-making and creating an EU council president and foreign minister, would introduce rotating representatives for member countries in the EU Commission, the union's executive branch, and would change the voting weights of countries on certain issues. Swedish Prime Minister Fredrik Reinfeldt, whose country currently holds the rotating EU presidency, said he welcomed the Czech court's decision. "We are now very close to full ratification." Reinfeldt said. "Together with a signature in the Czech Republic, the presidency will continue the completion of Lisbon Treaty preparations." The Czech Republic isn't the only EU country to demand an exemption before ratifying the treaty. Poland recently won an opt-out over social issues including gay marriage; Britain won assurances that EU law would not prevail over its own legal system. The treaty would also give national parliaments veto power over some proposed changes to EU policy. Irish voters approved the treaty last month after previously rejecting it. The European Union had assured Ireland that the treaty would not affect the country's anti-abortion laws or its neutrality and that Ireland would keep a European commissioner.